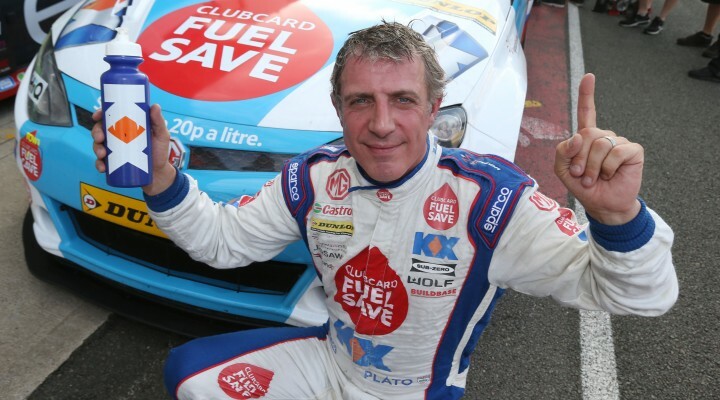 Jason Plato claimed the penultimate pole position of the 2014 Dunlop MSA British Touring Car Championship after producing an early flying lap that would not be beaten for the remainder of today’s qualifying session at Silverstone (27 September). It is the third consecutive year that the MG KX Clubcard Fuel Save star has secured top spot at his home circuit, although his session today had initially got off to a stuttering start when he slid wildly through Luffield. The double champion recovered to complete a clear lap at the end of his maiden run where he set a 58.511s benchmark. Still nearly three tenths off his own 2013 qualifying lap record times looked set to tumble later in the session, but unusually high track temperatures on a beautiful day in Northamptonshire seemed to put paid to any further improvements at the head of the field. Championship leader Colin Turkington was critically able to negate the deficit to his nearest challenger by setting the second fastest time in his eBay Motors BMW, whilst Plato’s team-mate Sam Tordoff ended up just 0.003s further behind in third. The young MG driver was targeting his third pole position in a row after recent successes at Knockhill and Rockingham but the Yorkshireman had to settle for a starting berth on the inside of row two at the home of British motor sport. Airwaves Racing’s Mat Jackson has a stellar record at Silverstone, having taken four BTCC wins at the circuit, and the 2008 championship runner-up will be a contender tomorrow after hauling his Ford Focus onto the second row. Team BMR will occupy row three with Aron Smith again getting the better of his double champion team-mate Alain Menu. With an impressive top speed the VWs look set to benefit from Silverstone’s long straights on race day. Warren Scott and Jack Goff completed the BMR quartet’s positions in 13th and 14th respectively. Tom Ingram continued his impressive qualifying displays during his maiden BTCC season with seventh place for Speedworks Motorsport, ahead of Quantel Bifold Racing’s Marc Hynes – the latter narrowly failing to match his recent season’s best from Rockingham. WIX Racing’s Adam Morgan and the Exocet Racing Audi of Rob Austin ran in tandem in the closing stages of the session and the duo seemed to spur each other on to claim positions in the top ten. eBay Motors’ Rob Collard just edged out Crabbie’s Racing’s rookie Jack Clarke for 11th. Surrey-based Clarke was as high as ninth at one stage before eventually having to settle for a hugely impressive 12th – the best of his short BTCC career so far. Clarke’s illustrious Motorbase stablemate Fabrizio Giovanardi could only manage 19th. The Italian wasn’t the only former champion to struggle, however, with the Pirtek Racing Honda of Andrew Jordan and the Honda Yuasa Racing cars of Gordon Shedden and Matt Neal immediately ahead of him in 16th, 17th and 18th respectively. The title winning quartet will be staring at the rear bumper of Aiden Moffat’s Chevrolet Cruze for the opening race. The teenager – who is 18 tomorrow – produced his best ever qualifying result with 15th. Such was the competitive nature of the session that the top 23 cars were separated by less than a second, which will have been little comfort for Dave Newsham whose session ended abruptly after he lost control of his AmD Ford Focus. The Inverness-based driver made contact with the barrier after spinning on cold tyres during his out lap and despite frantic efforts by his team they were unable to get the BTCC race winner back on track before the end of the session. Click here for the classification from qualifying at Silverstone.